A DESIGNER COMBINES OPULENT ACCENTS WITH FARMHOUSE CHARM FOR AN INVITING AND ELEGANT FRENCH DINING ROOM IN AN ARIZONA HOME. THE TRICK WITH A NEUTRAL PALETTE IS TO VARY THE TEXTURES AND ACCENTS SO THE ROOM DOESN’T ALL BLEND TOGETHER. 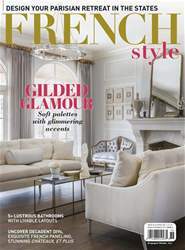 FRENCH STYLE CAN BE INTIMIDATING to emulate if you feel like you have to stick with fancy furniture, expensive chandeliers and elaborate wall paneling to get the look. But designer Jennifer Lincoln-Cutler, owner of The French Nest Co. Interior Design, explains that French style doesn’t have to be out of reach or out of your budget.